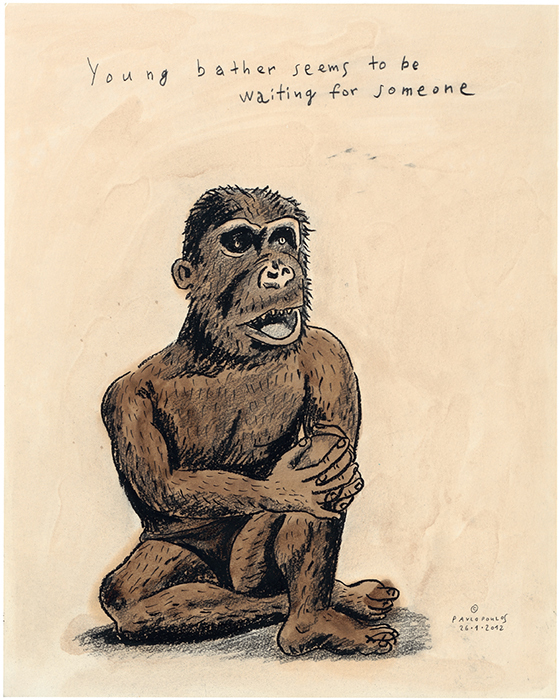 Tassos Pavlopoulos, Young bather seems to be waiting for someone, 2012, acrylic on paper, 20 × 16". In the catalogue essay Tassos Pavlopoulos wrote for his exhibition “Phantasmagoria,” the artist lays out a surprising thesis for a show that brought together drawings from the 1980s onward with recent works on paper and canvas, a film, and bronze sculptures. His early drawings, which he had intentionally kept hidden from viewers until now, Pavlopoulos writes, are “the seeds of [his] art,” underpinning all of his better-known works. These were mounted on a single wall: a dizzying, absurdist array that included a 1991 proposal for what the artist calls the “box with the crocodiles” project, in which he has drawn a crate with a crocodile head floating down a river in what appears to be a crude homage to the form of a Trojan horse. Order the PRINT EDITION of the September 2015 issue for $17 or the ONLINE EDITION for $5.99.